Energy storage and battery backup provides you peace of mind. With an energy storage system for your solar, your life doesn’t get interrupted when the power goes out. In the Carolinas, solar systems stop providing energy when an outage occurs as a safety precaution, preventing injury to neighbors and energy grid workers. With battery backup, your solar system will be able to continuously keep your house running. Once the power has been restored, thing go back to normal – you use your solar power or grid power, and charge your battery banks from your solar. The charged battery powers your kitchen and critical appliances such as your coffee maker and garage door opener so you can get to work on time. You have hot water and can charge your cell phone, perhaps you can run a single air conditioning unit. With minimal impact on your energy use, you can enjoy a normal day. Your solar system provides power to charge the battery. It allows you to use energy during the day while charging the battery to use at night. If you want, your fridge stays on. You don’t have to worry about eating all the ice cream, or what to do with wild game in that garage freezer! Renu Energy Solutions has trained professionals who will make sure your battery is configured to stretch your stored power as long as possible in the event of a multi day-long outage. Our team will work with you to make your that the essential powered services in your home that you rely on. Everyone uses energy differently, and depending on what you need most your battery can be sized to help sure your energy outlasts the outage. Your kitchen appliances, garage door, maybe your bedroom air conditioner unit, and critical electronics – can stay energized until the power has been restored. You can even set up your battery with special programming to help you make the most of your solar and avoid using more utility power than you have to. If you’re interested to hear about one of our energy storage success stories, learn about the first Sonnen battery installed in South Carolina. 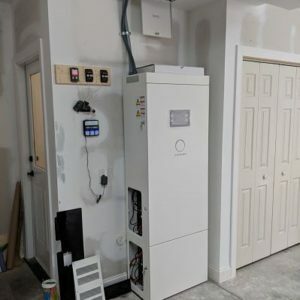 Renu Energy has been installing these automated, advanced battery systems for over two full years and can help you understand the advantages of using storage with your solar.